Fujiyama Taiki is a successor of the few Magic Japan tradition of " Tezuma " . His interest in magic in high school , and a member of the magic circle of the university at the same time as the Hosei University admission , to meet the stage magic . I won the prize in the contest various magic of creativity and beautiful expression in 2009 . I started on the path of professional magician with Shintaro Fujiyama studied with artists that have been awarded the Agency for Cultural Affairs Arts Festival Grand Prize at the same time as the college graduation in 2010 . Tezuma creation that uses a surface " seven changes " is well received in the world as well as Japan . Fujiyama Taiki will play is not performed remains a classic Tezuma is a classic , while leaving the format of the said and the " type " and " resemble " Taking advantage of the young idea , to create a work speedily . And what the common people of Edo fun to the audience , and I think that happiness , tells through Tezuma Did you dream . 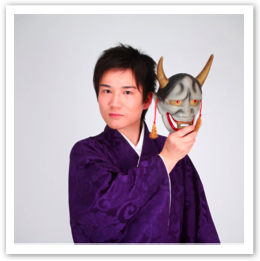 He has performed at stage 2012 / 06 Theatre Creation in " Tobikatou "